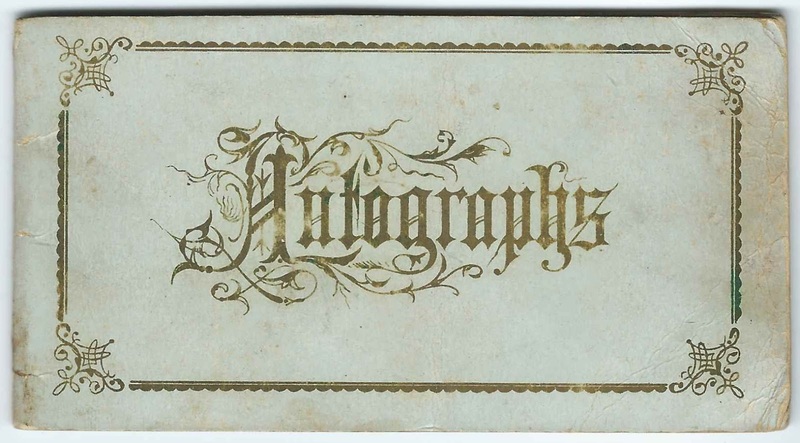 Small autograph album with inscriptions mostly from Sinking Spring, Ohio. One page was inscribed by Mary Easton to "Gordie". Gordie might have been Gordon or George or Georgianna. The album has soft covers and measures approximately 5" by 2-3/4". It contains the sentiments of 21 or 22 of Gordie's friends, at least one of whom, and possibly two, inscribed two pages. The Mary Easton who inscribed the left facing page below might be the same Mary who inscribed the page above. J. Easton inscribed the right facing page. Click on the image to enlarge it. Mattie T. Wickerham of Sinking Spring, Ohio; inscribed the page at left, below, on December 14, 1885. Ida [?] inscribed the right facing page. Click on the image to enlarge it. If you have information on Gordie or any of the inscribers mentioned below, please leave a comment or contact me directly. 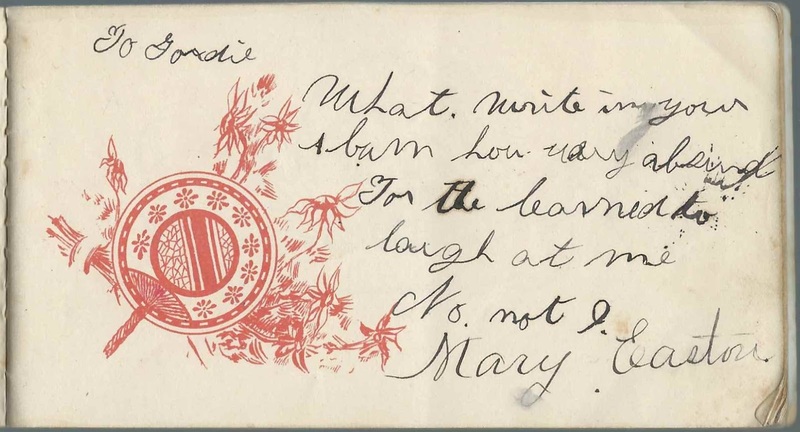 Ida; Mattie T. Wickerham of Sinking Spring, Ohio, inscribed the left facing page. Fred D. Clark of Rarden, Ohio, in Scioto County. He inscribed another page as well. Mary Easton; J. Easton inscribed the right facing page. J. Easton; Mary Easton inscribed the left facing page. Mattie T. Wickerham of Sinking Spring, Ohio; inscribed on December 14, 1885; Ida [?] inscribed the right facing page.